In essays written over the course of more than a decade, Kathryn Harrison has created a beautifully detailed and rigorously honest family album. With tenderness and wisdom, compassion and humor, Harrison writes about the things we don’t always discuss, casting light on what lurks beneath the surface of everyday life, sifting through the artifacts of memory to find what haunts and endures. Both serious and surprising, these essays capture the moments and impulses that shape a family. In “Keeping Vigil,” Harrison reflects on the loss of her beloved father-in-law, and how he managed to repair something her own father had broken. In “Holiday Lies,” she describes the uneasy but necessary task of lying to her children about Santa Claus and the Tooth Fairy, withholding certain truths to protect their innocence. In “Mini-Me,” she writes about how the birth of her youngest daughter—who used to pry open a sleeping Harrison’s eyes—finally allowed her to understand her own mother’s complicated attitudes about parenting. 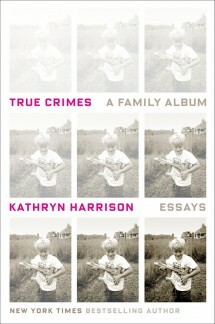 And in “True Crime,” Harrison writes for the first time in the almost two decades since the publication of The Kiss about her affair with her father, and how she has reckoned with the girl she once was.